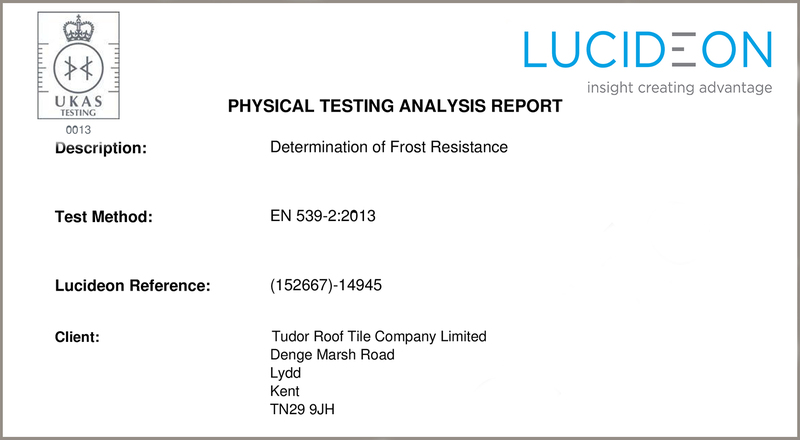 The 2015 Tudor Roof Tile Quality audit testing has now been completed by Lucideon (ex CERAM). This testing is required on all roofing products sold in the UK, and forms an audited and essential basis for the CE marking which is required by law on all building materials sold and used in the UK. Frost Resistance, Water Impermeability & Flexural Strength are the main certificates that buyers of roof tiles should ALWAYS ensure they have copies of. Tudor Roof Tiles has current and past copies always available for download from our ‘Tech Info / Docs & Certs & Brochure’ tab on this website. The 2016 audit is scheduled for September.